Geneticists at Texas A&M University College of Veterinary Medicine have conducted DNA testing on more than 40,000 bison from public and private bison herds. 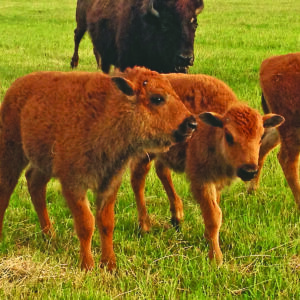 They have developed two genetic assays to uncover past evidence of hybridization between bison and domestic cattle. The first genetic test involves mitochondrial DNA (mtDNA) which is only passed from mother to offspring. You might remember from biology class that the mitochondria is referred to as the powerhouse of the cell because it is critical for energy conversion. What is this Animal: Bison, Buffalo, Beefalo or Cattalo? Bovid species evolved over millions of years in Africa, Asia, Europe, India and North America. While historically bison (American and European) are found in North America and Europe, buffalo are really old world species that evolved in Africa and Asia. Cape and Water buffalo evolved in Africa, while swamp buffalo and other large bovids (Anoa, Banteng, Gaur, Kouprey and Yak) developed in specific regions of Africa, Asia and India. Domestic cattle are thought to have descend from an extinct wild ox or aurochs in Eurasia (Bos taurus taurus), India and Africa (Bos taurus indicus).